Knee ankylosis is a common complication of knee trauma and infection that poses a serious challenge to orthopaedic surgeons regularly in their practice. This study highlights the success of the use of Ilizarov device in the management of fibrous ankylosis of the knee. A 37-year-old nurse with a fibrous ankylosed knee that had a range of movement (ROM) of 0°–40° was successfully treated with Ilizarov device, indomethacin (analgesics) and physiotherapy. Her ROM of the affected right knee improved to 0°–140° and after a follow-up period became 0°–90°. She was very happy with the outcome. There was no associated knee pains afterwards. Ilizarov device, together with adequate analgesia and physiotherapy, can successfully treat knee ankylosis. Ankylosis of the knee is a common complication of near-knee joint injury such as fractures, blunt joint injury and infection. The fracture injury may be part of multiple injuries which may include head injury. Unconsciousness in head-injured patients may result in the knee injury being missed, neglected or its treatment deferred until the unconsciousness improves to the point it can safely be treated. This delay provides enough time for the knee to become stiff. In our environment, distal femoral fractures managed by traditional bone setters (TBS) often result in the knee joint being locked up in splints for a very long period in a bid to achieve fracture union. This is even made worse in patients with head injury. Knee joint injuries that have hemarthrosis and are not drained and irrigated are prone to calcification of the joint. Joints that are not mobilised on time following trauma suffer from fibrous contracture of the muscles and joint ligaments. Fibrous contractures lead to fibrous ankylosis, while calcification leads to bony ankylosis. These are complications that can affect joint when near-joint injuries are poorly managed and ankylosis is very difficult to treat. We present the case of a patient with a 5-year history of fibrous ankylosis of the left knee joint with marked limitation of joint movement that was successfully managed in DELSUTH, Oghara, using Ilizarov, and a review of literature. The patient is a 37-year-old unmarried female nurse that was involved in a road traffic accident 6 years ago when she was 31 years old. She sustained closed fracture injuries of the right tibia and left femur and severe head injury with a Glasgow Coma Scale score of 5/15. She was managed in the Intensive Care Unit for the head injury and recovered fully from her unconsciousness. She was offered open reduction and internal fixation for her fracture injuries but declined and opted for TBS treatment because of family pressure. 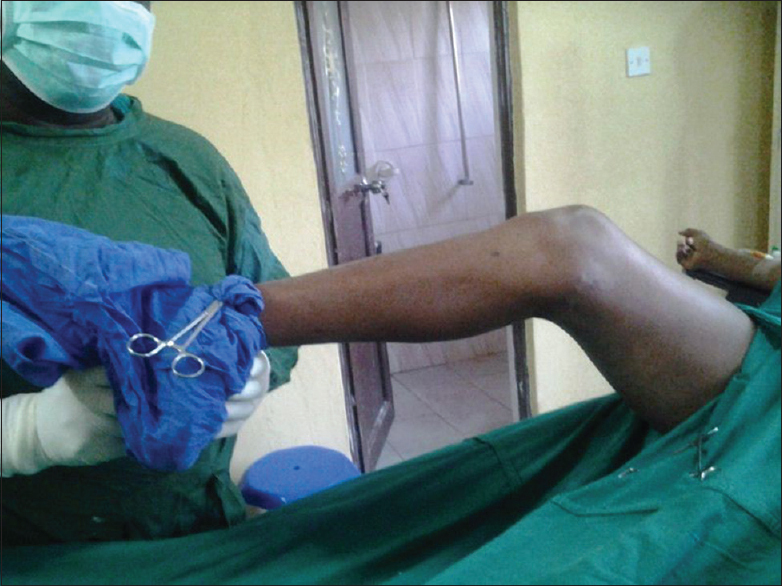 She later represented 4 years later at DELSUTH, Oghara, with features of malunion of left femoral and right tibial fractures and fibrous ankylosis of the left knee joint. The range of movement (ROM) of the right knee joint was 0-40° [Figure 1] and [Figure 2] while that of the unaffected left knee joint was 0-150° [Figure 3]. There was no limb length discrepancy between the two lower limbs. 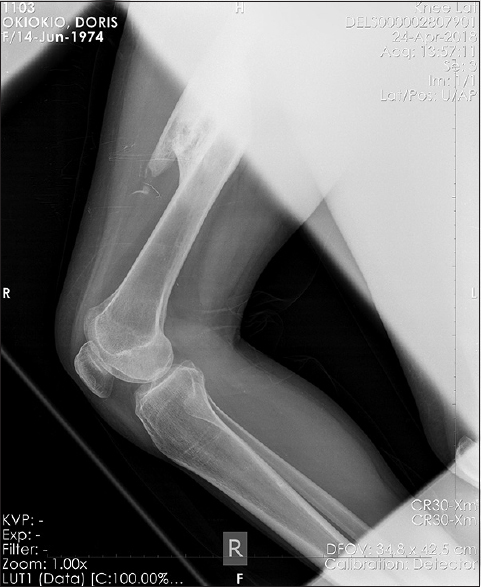 X-ray showed no bony abnormality of the knee joint [Figure 4]. She was counselled to have correction of the ankylosis using Ilizarov technique with Ilizarov rings. 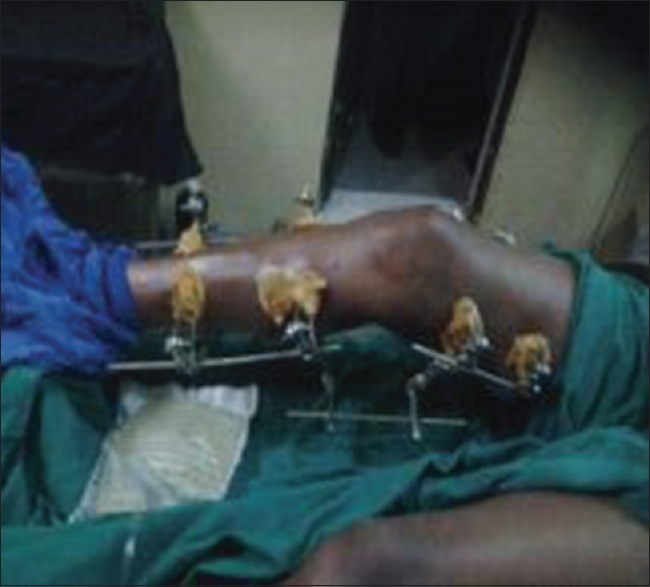 Two half rings were inserted on the femur and left tibia by means of k-wires and tensioner [Figure 5]. The rings on the femur and tibia were connected with hinged connecting rods. Two days after application of the rings, the knee joint was gradually flexed by turning the nuts on the connecting rods at the rate of 180° every 6 h. The patient was placed on analgesics (indomethacin 25 mg 8 hourly and tramadol 50 mg 6 hourly) and muscle relaxants (methocarbamol 500 mg 6 hourly) for pain control. The analgesics and muscle relaxants were given 1 h before turning the Ilizarov connecting nuts. This continued until the knee was flexed up to 140°. At this point, the Ilizarov device was removed and passive and active ROM exercises were commenced by the physiotherapist. 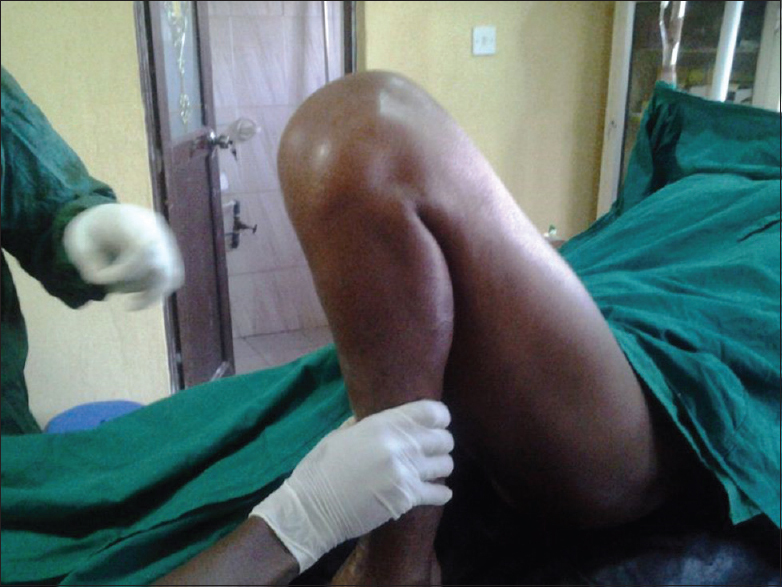 The patient continued the use of analgesics and muscle relaxants during the period of post-operation physiotherapy and was monitored in the outpatient clinic on the progress made. It is now 2 years post-operation, her present ROM is now 0°–90°. There is no pain felt in her knee. She is very happy at the outcome [Figure 6], [Figure 7], [Figure 8] and has returned to work as a nurse. Ankylosis is frequently a complication of joint injuries and this has been found in patients that had associated head injury. Head injury predisposes these patients to ankylosis by two mechanisms: (1) they result in the injury being missed or neglected and (2) head injury is associated with heterotopic calcification. As a result of the neglect, there is ample time for ossification of the joint to occur. An incidence of 20% of heterotopic calcification has been reported. In this study, our patient had head injury that delayed the fracture treatment. And even when she recovered from the head injury, she refused surgical treatment in the hospital. She opted for a TBS treatment of the fracture injuries that did not prevent knee joint stiffness from occurring. The sympathetic joint pain (osteodystrophy) resulting from a nearby fracture will prevent the patient from mobilising the joint. All these factors will compound joint stiffness. Ilahi et al. in their study of 41 patients determined the relationship between treatment of fracture and heterotopic ossification. They found that treating a fracture injury within 48 h reduced the incidence of heterotopic ossification of the joint. Our patient had treatment of the fracture with no attention given to the knee joint for over 4 years, thus providing ample time for stiffness of the knee joint to set in [Figure 4]. Pain is another contributory factor to the stiffness. 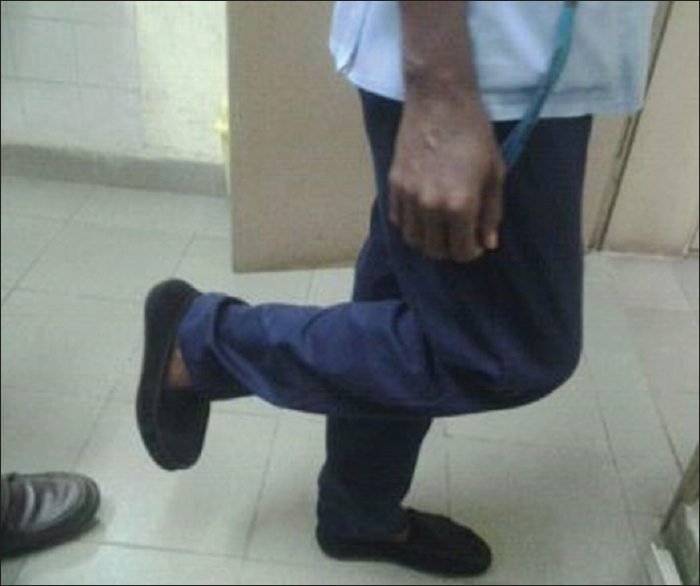 Joint pain during movement of the injured joint creates a reluctance by the patient to move the joints. This further worsens stiffness, thus creating a vicious cycle. Following a near-joint injury, adequate analgesia is needed to alleviate the pain to enable patient mobilise the joint. With TBS treatment, effective analgesia is not provided; hence, the patient refuses to move the joint and easily develops ankylosis. In this treatment, adequate analgesia was ensured during the period of use of Ilizarov device and physiotherapy to ensure that pain is adequately controlled. Heterotopic ossification, a complication of head injury and knee injury itself, can be controlled or prevented by the use of drugs such as indomethacin and irradiation., In this study, we made use of indomethacin to achieve this purpose. It is also a non-steroidal anti-inflammatory drug and doubled also as an analgesic. We did not use irradiation therapy because it was not available. Some authors have employed the use of irradiation therapy with documented efficacy at a dose of 1000 cGy given over a period of 5 days. It is important to note the role played by TBS in the development of fibrous ankylosis in this patient. Their activity in splinting joints during treatment provides enough time for ankylosis to develop. There is a need to educate people on the drawbacks associated with TBS treatment of fracture injuries such as ankylosis. Ilizarov device, along with adequate analgesics and physiotherapy, is effective in the management of knee ankylosis. The need for government to regulate the activities of TBS and make health-care services accessible and affordable to the citizenry cannot be overemphasised. Foruria AM, Augustin S, Morrey BF, Sánchez-Sotelo J. Heterotopic ossification after surgery for fractures and fracture-dislocations involving the proximal aspect of the radius or ulna. J Bone Joint Surg Am 2013;95:e66. Kushwada VP, Garland DG. Extremity fractures in the patient with a traumatic brain injury. J Am Acad Orthop Surg 1998;6:298-307. Odatuwa-Omagbemi DO. 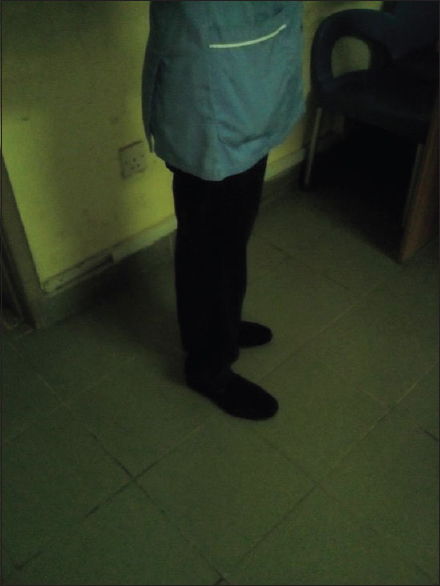 Complications of traditional bone setters practice in Nigeria: The need for urgent action. Niger Res J Clin Sci 2012;2:1-5. Louis S, David JW, Selvadurai N. Apley's System of Orthopedics and Fractures. 8th ed. New York Oxford University Press;2001. p. 8. Ilahi OA, Strausser DW, Gabel GT. 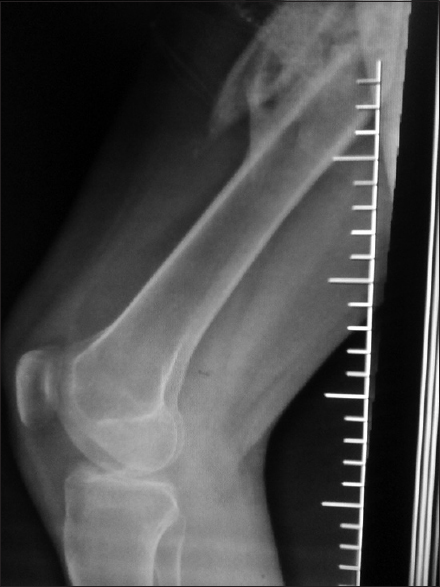 Post-traumatic heterotopic ossification about the elbow. Orthopedics 1998;21:265-8. Saudan M, Saudan P, Perneger T, Riand N, Keller A, Hoffmeyer P, et al. Celecoxib versus ibuprofen in the prevention of heterotopic ossification following total hip replacement: A prospective randomised trial. J Bone Joint Surg Br 2007;89:155-9. Hamid N, Ashraf N, Bosse MJ, Connor PM, Kellam JF, Sims SH, et al. Radiation therapy for heterotopic ossification prophylaxis acutely after elbow trauma: A prospective randomized study. J Bone Joint Surg Am 2010;92:2032-8. Ilizarov GA. The tension-stress effect on the genesis and growth of tissues: Part II. The influence of the rate and frequency of distraction. Clin Orthop Relat Res 1989;239:263-85. Gartsman GM, Bennett JB, Cain TE. Surgical correction of severe knee pterygium. Microsurgery 1988;9:246-8. Damsin JP, Ghanem I. Treatment of severe flexion deformity of the knee in children and adolescents using the ilizarov technique. J Bone Joint Surg Br 1996;78:140-4.